Guidelines for Rescuers / Rescue Organizations . 1. Rescuer should not breed birds, therefore adding to the problem. 2. Rescued birds should NEVER be sold. 3. Rescued birds should NOT be bred, therefore adding to the problem, UNLESS they belong to an endangered species. Please scroll down for listings of rescue organizations or check in your local Yellow Pages to see if you have a reputable Bird Rescue Organization in your area. NOTE: REAL rescue organizations do not breed nor sell birds. I have added the below rescue organization in good faith, but I would recommend for anyone wanting to place their bird to check any of them out very carefully, before doing so ... IMPORTANT: Please read this information before re-homing any birds or donating any money! My first choice will always be to adopt - and not buy! You have the ability to make a critical difference in the life of a displaced parrot! This being said, below are your options. NOTE: These listings are added and maintained by Avianweb as a public service. Even though we don't actively research the rescue organizations wishing to be listed -- we do reserve the right to remove any rescue organization about which credible negative information has come to light (which usually is mistreatment, neglect, breeding or selling of “rescued birds” for profit). Finest Feathers Bird Sancturay wildoneswelcomed@gmail.com Finest Feathers is based in Lake Elsinore, CA and has a second location in El Cajon, Ca. Accept all birds, except those that by law should be given to the wildlife rehab department. They are not a medical facility, so they cannot take in those needing urgent verterinay care. www.beaknwings.org - a licensed shelter for the State of Kansas involved in rescue and adoptions. Peace Paws and PALS (Parrot Assisted Living Services) is located in Lansing MI and we take in birds of all sizes. They are 501(c)3 tax exempt, and offer indoor free flight for both large and small birds. Website is listed below, none of the birds are adopted out once they arrive at our sanctuary, but some are used in our parrot therapy programs. Feel free to inquire about any further questions. Jessy Owens, Peace Paws,www.petfinder.com Preventing Exotic and Avian Cruelty Everywhere. Springfield, Missoury: Parrot Education, Adoption, and Rehabilitation (PEAR) serves as a temporary sanctuary facility for exotic birds. Contact: Erin Sorensen- www.peartree-sanctuary.org - a 501(c)3 non-profit organization. Rescue, rehabilitate, and adopt out relinquished parrots. Offer parrot owners education and assistance with basic bird care, nutrition, and behavior issues. Northeast Avian Rescue,13 Couse Place, East Greenbush, NY 12061 - Rescue/Adoption hotline (518) 708-6091 Rescue/Adoption contacts: Robert Lewis: bob@ringobirds.com (518) 209-4056, Lauren Palmateer: lmcguire1@nycap.rr.com. Do adopt out and will accept any parrot. Have three foster locations and are willing to provide both fostered and facilitated adoptions depending on the surrenderer's needs. Serving Eastern New York and adjoining states. Long Island, NY: Specialize in birds with medical/physical/emotional problems that are difficult to place. Also work with bird owners who would like to try to keep the birds and encourage them to try to work things out. Contact: HomeTweet@aol.com - Tel. 631-896-2913. Tulsa Ok - Safaris zoo - a private zoo outside Broken Arrow, Ok....Lori, the owner and founder, is on a local tv station at least once a month with animals and parrots promoting awareness of the responsibility of ownership of exotic pets. She will take in smaller birds, but calls me to help her find a home for them. She can be reached at 918-955-1964 or at ladysafari@valornet.com. Lair Of Dragons Bird Rescue and Sanctuary located in Lancaster, Pennsylvania 717-431-8599. An exotic bird rescue 7 sanctuary dedicated to preserving the welfare of companion parrots. Adoptions, rehabilitation, medical and sanctuary home for birds whom can not be adopted out do to aggression, behavioral or medical problems. e-mail: contact@lairofdragonsbirdrescue.com. Have strict policies and require a contract to be signed. Absolutley no breeding, selling, giving away or using any bird for entertainment purposes. The Budgie Sanctuary - a budgie sanctuary for unwanted and neglected budgies. Also please check in your local phone directory. 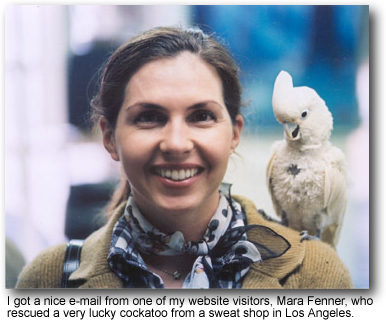 I know that, for example, in San Diego, California, they have an excellent Parrot Rescue Organization that places birds in carefully screened homes. Your area may also offer this kind of non-profit organization.